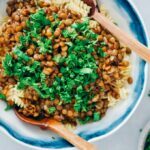 Vegan Bolognese made with green lentils. A wonderful alternative to classic bolognese sauce. Heat olive oil in a sauce pan, add chopped onion and sauté until tender. Add in tomato paste and cook for 5 minutes. Add in green lentils and the spices. Pour 1 cup water. Cook until lentils are tender and remove from heat. Pour the lentil sauce over the cooked pasta. Sprinkle chopped parsley and stir. Serve it either hot as a main dish or cold as a salad.